Charles Bridge (in Czech: Karlův most) is an iconic landmark in the very centre of Prague. The bridge crosses the Vltava river and connects the Old Town (Staré Město) with the Lesser Side (Malá Strana). It is not the oldest Czech bridge, because this title goes to the Stone Bridge in the town of Písek in South Bohemia. 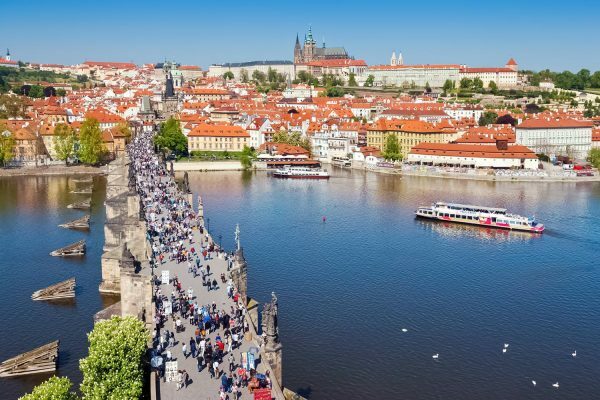 But Charles Bridge is definitely the most famous bridge in Czechia and perhaps also in the whole of Europe. Most of the time, Charles Bridge is a crowded place. No tourist can miss it. And many of these tourists don’t just cross it; they tend to hang out there, take selfies and look at all the souvenirs offered by the numerous vendors present there. It is not a bridge you can simply cross to get to the other side of the river; you must admire the bridge and its surroundings. If you’re a photographer and would like to have photos of the bridge without crowds of random people, the only way is to get there before dawn. But even then, it can take some patience to capture Charles Bridge without people. The construction of the bridge started in 1357 and the work was completed at the beginning of the 15th century. The balustrades are decorated with 30 statues added during the Baroque period. In the 20th century, the statues were replaced with replicas and the originals were moved to a museum. The bridge is named after King Charles IV, who ordered its construction. There had been another bridge at the same location. It was called Judith’s Bridge. It collapsed during a flood in 1342. The architect in charge of the construction of the new bridge was Petr Parléř. By the way, he also contributed significantly to the famous St. Vitus Cathedral at Prague Castle. The construction of the bridge took 45 years and the bridge was opened in 1402. 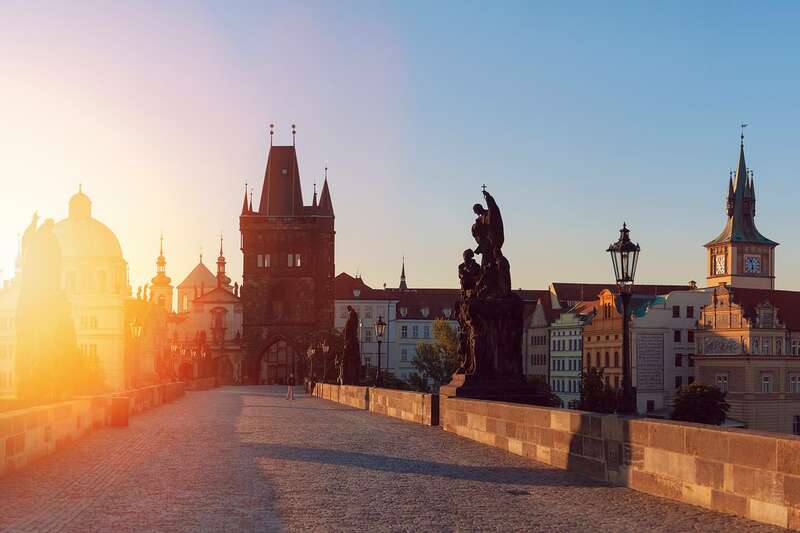 Not many people know it, but the name Charles Bridge is relatively recent. Until 1870, it was called “Stone Bridge”, just like the aforementioned bridge in Písek, or simply “Prague Bridge”. The bridge is 515.76 m (ca. 1692 ft) long and its width is between 9.40 m (30’ 10’’) and 9.50 m (31’ 2’’). The bridge has 16 arches. There are medieval towers on both ends of the bridge. They are named appropriately: the Lesser Side Bridge Tower (Malostranská mostecká věž) on the left bank, and the Old Town Bridge Tower (Staroměstská mostecká věž) on the right bank. As a matter of fact, there are two Lesser Side Towers, next to each other. The older and smaller Romanesque tower is from the 12th century. The taller, Gothic tower is from the 15th century and it resembles the tower on the opposite side of the bridge. You can climb both the Old Town Bridge Tower and the Lesser Side Bridge Tower. The reward are stunning elevated views of Prague. The view from the Old Town Bridge Tower is somewhat more popular. 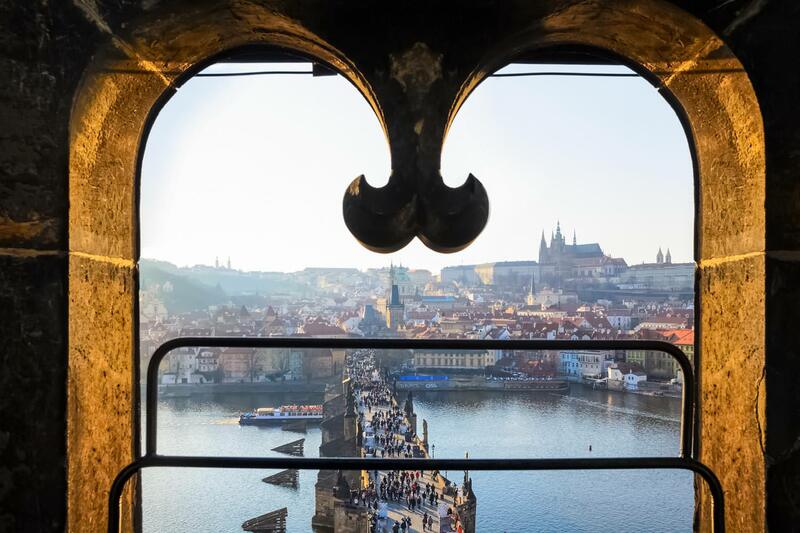 From there, you can capture the whole of Charles Bridge with Prague Castle in the background in one photo frame. This is one of the classic views of Prague. 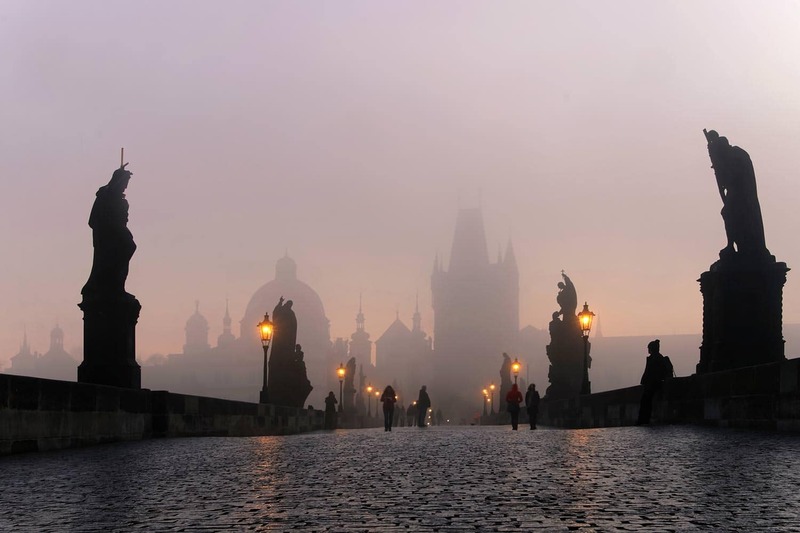 Finding Charles Bridge is simple. It connects two most important areas of tourist interest in Prague: the Old Town (Staré Město) and the Lesser Side (Malá Strana). If you are going from the Old Town to Prague Castle you may cross the Vltava on Charles Bridge. This is not the only bridge that can take you there, but this route is perhaps the most picturesque. The nearest underground (subway) stations are: Malostranská on the left bank and Staroměstská on the right bank. They are both on the Line A of the Prague Metro. Several bus and tram stops are a little closer to the bridge than these metro stations. You can take the tram lines 2, 17, 18 and 93 to Karlovy lázně and walk from there to the bridge along the right bank of the Vltava. On the left bank, you can take the tram lines 1, 12, 20, 22, 23, 41, 97 and get off at Malostranské náměstí. 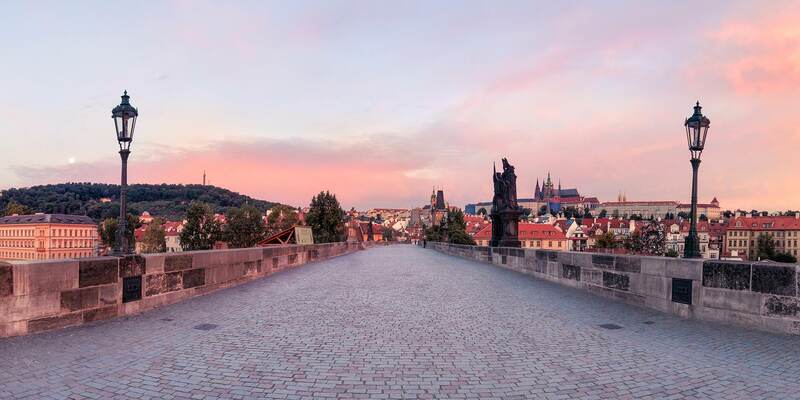 From there, you’ll walk a few minutes down the rather pretty Mostecká Street, and when this street ends, you’ll find yourself on Charles Bridge. 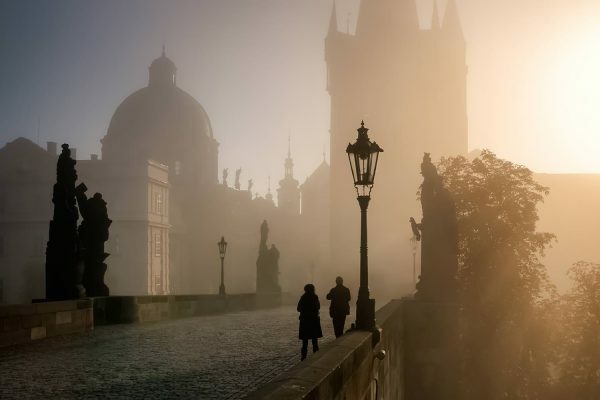 During the 20th, and the early 21st century, Charles Bridge underwent several renovations. Regular repairs are necessary to preserve this masterpiece of medieval architecture for future generations. The authorities have announced plans to begin the next stage of renovation work in the late 2019. It is expected that the work will take around 20 years. During this period, sections of the bridge may be covered with scaffoldings. 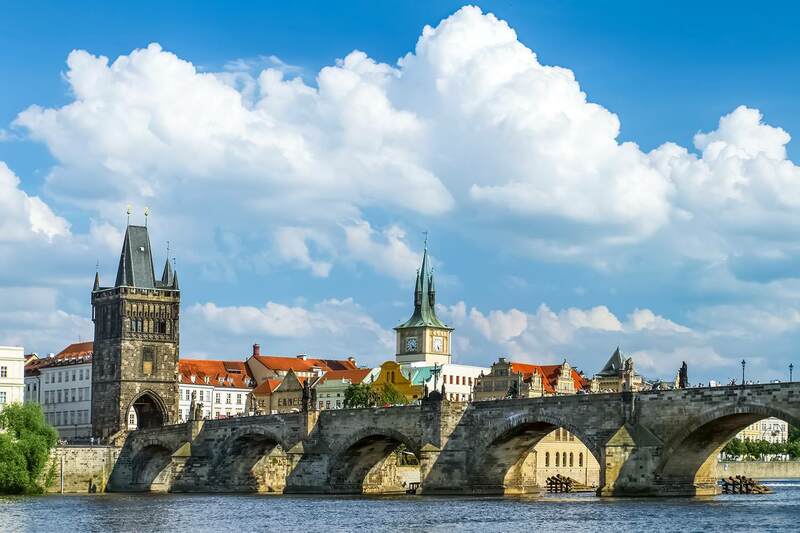 Therefore, if you would like to capture the classic view of this iconic bridge in a photograph without any scaffoldings, it may be a good idea not to postpone your trip to Prague for later. Information and advice about travelling to Prague and Czechia are on this page. Are you coming to Prague? 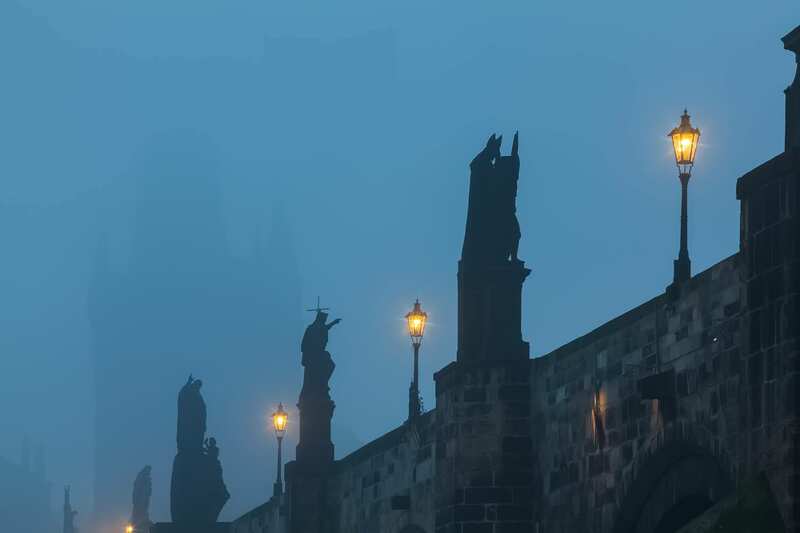 How about staying near Charles Bridge? The fantastic Hotel U 3 Pstrosu is an excellent accommodation option near Charles Bridge, in Malá Strana. It is a 4-star hotel with excellent reviews, but the prices can be surprisingly attractive, for a hotel of its class. Public transportation (metro/trams) is within walking distance. Booking well in advance is recommended. Check the price and book your room. Hotel Liliova Prague Old Town is another affordably priced 4-star hotel. As the name suggests, it is located in the Old Town. 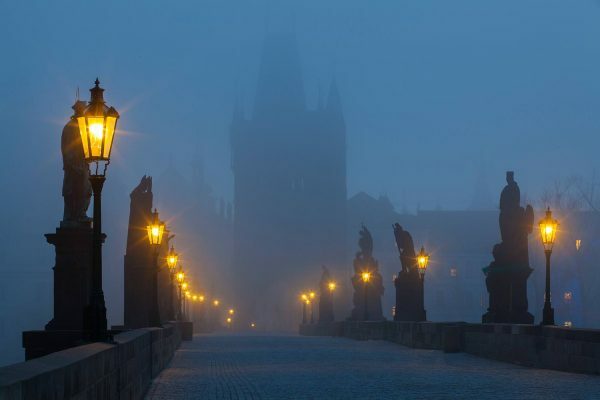 Charles Bridge is within walking distance. You can get up at dawn and walk to the bridge to experience this amazing landmark without the crowds of tourists, who will appear there later. Booking in advance is a good idea, because it is a relatively small hotel offering great value for money. Check the rates and book your room. Residence U Malvaze is a great accommodation option located next to Charles Bridge, on Karlova Street, which is part of the medieval Royal Route. The Royal Route leads from the Old Town to Prague Castle, through Charles Bridge. It was used for coronation processions of Czech monarchs, and hence the name. This excellent hotel is located between Old Town Square and Prague Castle, so it is a perfect base for exploring the old part of Prague. Check the rates and book your room.